Red Youth takes this moment to reaffirm our solidarity with the Libyan people and our support for the brave fighters of Libya’s Jamahiriya. Brother Gaddafi has been declared dead a great many times since March, but should the latest news be true we are confident that the Libyan people will continue to overcome the occupation forces! Whatever truth there is in today’s reports of the murder of Muammar Gaddafi, one thing is certain; if Gaddafi has been killed it was not the work of the Libyan people. The first salvos in this imperialist war of aggression were fired by the French and British imperialists. 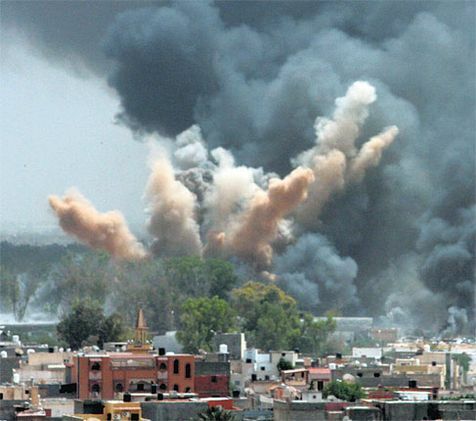 These despicable and cowardly attacks were followed by seven months of carpet bombing of Libyan cities, hitting and indeed targeting hospitals, schools and residential housing. The hope was that such brutality and an overwhelming show of force would frighten Libya’s citizens, cause panic in their ranks and cause them to abandon their independence and freedom. The last seven months prove that it did nothing of the sort. Contrary to their ongoing campaign of lies and misinformation (fed via Al-Jazeera, the BBC and other compliant imperialist media outlets) the NTC has no control over most of Libya, is too scared to move its headquarters to Tripoli and is riddled with infighting. The people of Libya rallied ever closer around Gaddafi and have fought a long and heroic struggle against imperialism and show no signs of stopping whatever happens. There can be no justification for this Nazi terror that was unleashed by imperialism. Those on the ‘left’ who adopt positions which seek to ‘explain’ the reasons for this attack on mistakes made by Colonel Gaddafi in his ‘rapprochement’ with imperialism misunderstand the basics of diplomatic manoeuvring and seek cover for those opinions which they share with imperialism – namely that Gaddafi was a butcher, a despot, a dictator and somehow deserves to be ousted or murdered. They miss the whole point – imperialism cares not a jot about dictators and despots! Worse still the Trotskyist imperialist cheerleaders will tonight be celebrating another great victory for the working class just as they did in 1991! As the collapse of the Soviet Union was a disaster for the peoples of that nation, so too will it be a disaster should Libya fall completely under the grip of imperialism and their local contras. But we remain resolute in our conviction that the Libyan masses will do everything they can to prevent such a calamity! With terror reigning down from the skies, imperialism organised, led and continues to direct a band of cut throat savages on the ground. This scum masquerading as ‘revolutionaries’ and ’freedom fighters’ have committed numerous lynchings, murders and all manner of crimes but the brave Libyan resistance fights on undeterred. If this scum have got their hands on Gaddafi then he dies a martyr – a martyr in the fight against imperialism, a champion of the oppressed peoples! The Libyan people will continue to push on, they are all too well aware of the future that awaits them if they succumb to colonial subjugation. As in Iraq and Afghanistan; imperialism lifts a rock only to drop it on its own feet – more heavy defeats will greet the aggressors in the near future. 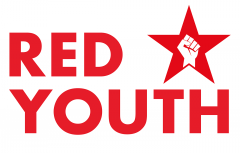 Red Youth stands in solidarity with the Libyan resistance. We have been shown in seven months of courageous fighting that Libyan’s value their independence and freedom more than anything else – no force on earth can stop them if they are united against imperialism!